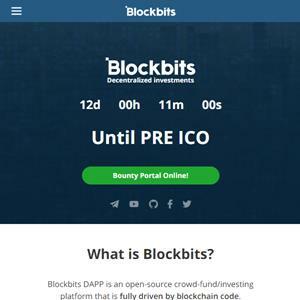 Blockbits DAPP is an open-source crowd-fund / investing platform that is fully driven by blockchain code. It provides innovative mechanisms such as safe funding vaults and secure milestone based payments. The platform offers to both investors and project owners investing tools and minimal to zero fees. Our platform is designed to become fully independent, maintained and governed by its own token holders. Blockbits itself is launched through the very code submitted here as MVP. It is not a Venture Capital Fund, nor an Investment Fund. It is a platform where you launch your project and the community is going to be the one moderating the content.